Drexel (10-18, 8-9) at William & Mary (18-10, 12-5) – 2:00 PM ET, Saturday. For William & Mary, it is simple – beat Drexel and you clinch both a share of the CAA title (at least) and the No. 1 seed in Baltimore next week. KenPom gives the Tribe a 90 percent win probability, which should probably be higher in the wake of Drexel’s most recent rash of injuries. UNC Wilmington (17-11, 12-5) at Elon (13-17, 5-12) – 7:00 PM ET, Saturday. After finishing last in the CAA last season, UNC Wilmington can claim a share of the regular season title by beating Elon on Saturday. Since the Seahawks were swept by William & Mary, though, they need the Tribe to stumble in order to clinch the top seed. If both the Tribe and Seahawks lose? Northeastern and James Madison could also claim a share of the crown, but William & Mary would own any and all tie-breakers. Oakland (16-14, 11-4) at Green Bay (21-7, 11-4) – 2:00 PM ET, ESPN3, Saturday. Valparaiso’s road win over Cleveland State last night gave the Crusaders the regular season championship and the top seed. Spots two and three are still up for grabs in this one, though, as the winner will receive the other double-bye to the semifinals in the eight-team tournament. 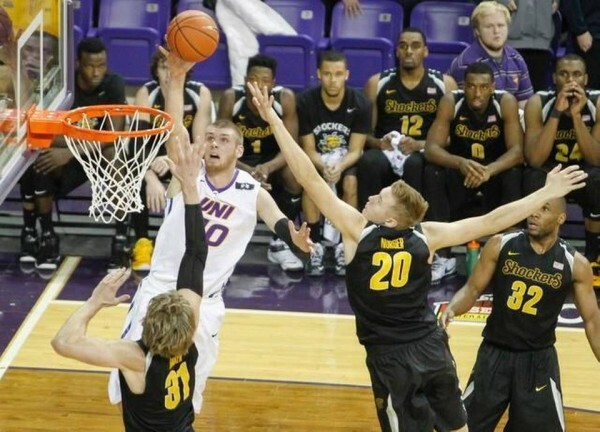 Northern Iowa (27-2, 16-1) at Wichita State (26-3, 16-1) – 2:00 PM ET, ESPN, Saturday. How big is this game? ESPN’s College GameDay will be there – Jay Bilas and all. More importantly, the winner clinches the outright Missouri Valley championship and notches a huge, resume-bolstering victory just two weeks before Selection Sunday – something Wichita State might really need. In a recent podcast episode, CBS Sports bracket guru Jerry Palm suggested that if the Shockers lose to Northern Iowa this weekend and lose again in next week’s conference tournament, their dearth of quality wins could prevent them from making the Big Dance altogether. The good news for Gregg Marshall is that his team hasn’t lost in Koch Arena since February 27, 2013, and big man Darius Carter – who was dealing with back pain earlier in the season – put together a 20-point, 11-rebound performance against Indiana State on Wednesday. He will need to do a better job this time around against Panthers forward Seth Tuttle, who torched the Shockers for 29 points in a dominant victory back in January. Expect a better defensive effort from Wichita State on Saturday and a more competitive game overall, one closer to the pressure-packed, back-and-forth grinder a lot of us are hoping for. But even if it doesn’t live up to the hype, don’t fret – Arch Madness is only six days away. Bucknell (17-13, 12-5) at American (15-14, 8-9) – 12:00 PM ET, Saturday. If Bucknell beats American, it wins the outright conference championship and plays on its home court throughout the Patriot League tournament. Of course that’s easier said than done against a glacially-slow Eagles unit that’s only twice lost at home this season. The Bison won by 10 in their first meeting, but that was all the way back in December. Lehigh (16-12, 10-7) at Colgate (14-16, 11-6) – 2:00 PM ET, Saturday. Your eyes aren’t deceiving you; Colgate, the sub-.500 team, is in position to claim a share of the league title and earn the No. 1 seed (by virtue of sweeping Bucknell) if it beats Lehigh and the Bison lose on Saturday. The Mountain Hawks come in hot after crushing Bucknell by 19 earlier in the week, however, so don’t be shocked if the Raiders drop this game at home. This entry was posted on Saturday, February 28th, 2015 at 8:31 am by Tommy Lemoine	and is filed under microsites, other 26. 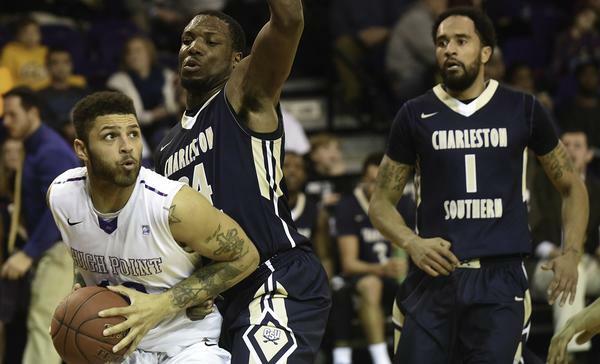 Tagged: arch madness, atlantic sun, big south, bucknell, caa, charleston southern, cleveland state, colgate, dunk city, feature, green bay, greg marshall, high point, horizon league, john brown, missouri valley, north florida, northern iowa, oakland, patriot league, seth tuttle, valpo, wichita state, william & mary. You can follow any responses to this entry through the RSS 2.0 feed. You can leave a response, or trackback from your own site.